Side lights and transom enhance any entry. 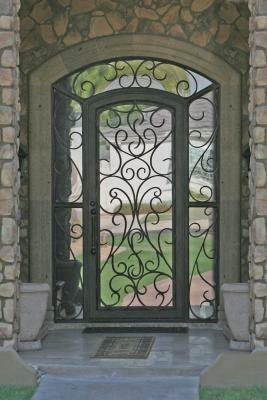 This is a Signature Iron Entry Door done for a family near Chandler Arizona. Our sales team works with homeowners and contractors to match homes and iron work flawlessly. All our iron is hand forged and manufactured to last in grace with low maintenance. Call us and come by our showroom to see a variety of doors and to discuss with a sales representative how you can receive an iron entry door with side lights and transom for your home.